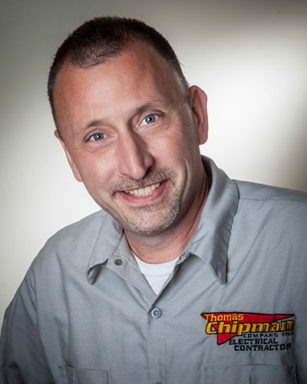 As president of Thomas Chipman Co., Inc., Tom is responsible for the company’s day-to-day operations and sales. Tom began his electrical career in 1988 as a Massachusetts licensed electrician. With his first employer, he gained valuable trade experience working on electrical projects in medical research centers, laboratories, hospitals and on Johnson Andover controls. In 1992, Tom teamed with a partner to expand into voice and data, fire alarm systems and facility work. It was during this time that Tom learned how to build trust while building a business, transitioning from an electrical installer to a seasoned business leader. 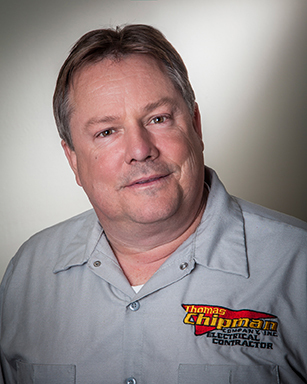 In 1995, Tom founded Thomas Chipman Co., Inc., and expanded his services to include commercial and industrial electrical work across a wide range of industries, including healthcare, retail, hospitality, medical and more. In his 21 years of experience, he has built a loyal base of customers, due in large part to his expertise and team of dedicated personnel who have been by his side since he founded the company. Tom is active in his community and has volunteered for the Holliston Parks and Recreation Department for 11 years, serving as a past chairman and as a present member of the board. Tom believes in giving back to his community by donating his time and resources to local projects, including scoreboards, baseball field lighting and holiday lighting. He and his company also donate yearly to several local charities. In addition to his Massachusetts electrical license, Tom holds an S-License from the Department of Public Safety and is a member of the Massachusetts Electrical Contractors Association, Inc.
As director of estimating, Kelley is responsible for understanding what outcome a customer wants from their electrical project and providing solutions and cost estimates to deliver on those goals. Kelley began his electrical career in 1989 as a Massachusetts licensed electrician. With his previous employers, Kelley gained valuable trade experience working on electrical projects in high-end homes, retail properties and hotels, as well as on fire alarm installations and commercial/industrial projects. In 1999, Kelley joined Thomas Chipman Co., Inc. as a master licensed electrician but was quickly promoted to project foreman and project manager before taking on his current role. In his 17 years with the company, Kelley has demonstrated vast technical knowledge and a strong work ethic. He continues to gain electrical expertise and stay abreast of industry innovations by attending various training programs throughout the year. Kelley credits his success with his ability to work well with all types of professionals, collaborating daily with facility managers, business owners, contractors, homeowners, architects and engineers to bring his electrical knowledge to their respective projects.